Last week, I received my first PR pitch. Okay, it really wasn't a pitch, but PR pro and reader Beth suggested that I post this punch recipe that she recently made for a shower. She said people couldn't stop raving about it. So Beth, this Thirsty Thursday is dedicated to you and your punch. In a large bowl, combine gelatin and sugar. Stir in boiling water until mixture is dissolved. Stir in pineapple juice and lemon juice concentrate. Divide into 2 containers, and freeze until solid. To serve, place gelatin mixture in punch bowl, and chop into pieces. Pour in ginger ale. "I used three cups of sugar and added cut up strawberries and raspberries. mmmmm. would be better with vodka but it was for a baby shower at work so that didn't fly." 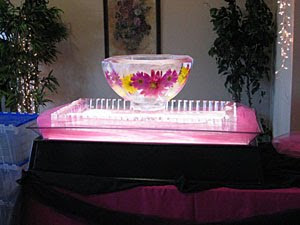 The picture to the right is a decorative ice bowl from Innovative Ice. I'll tell you how to make one of those later!